My friend Donald and I could not be more different. He, a retired manufacturing manager, MBA, and expert in "Lean" manufacturing, now teaching statistics at college, and me, your crusty and dusty reporter, content to scrape (and saw, and sand) by in the relative obscurity of my retirement and occasionally jot down a few lines about my experiences. We spend hours discussing politics, current events, and world economic theory, but not once had I visited his classroom, and not once had he ventured into my workshop — until recently. On a bet (that I lost) I had to buy Donald a complicated coffee drink at the trendy college campus coffee shop, and as a favor, my professorial friend helped me lift the motor assembly of a new drill press onto its support column. I had very little to say (and certainly nothing profound) when I visited his classroom, but after eyeing my shop for a few moments he proclaimed, "Without knowing it, you have perfectly 5S'd your shop." Days later I realized that it was a backhanded compliment at best, and also realized after some research, that he was, as usual, correct. The 5S Program is a component of Lean Manufacturing, and is intended to help produce higher efficiency and quality and to reduce waste. The origins are a bit murky, some claiming that the Japanese learned it from Henry Ford and Frederick Taylor (author of Scientific Management, 1911) and that 5S is a direct outgrowth of Ford's CANDO program, while others say that 5S is a result of the pioneering work that Sakichi Toyoda, the founder of Toyota did in conjunction with his son and his chief engineer. Regardless the history, this sound and widely emulated program is based on five Japanese words, all beginning with "S". The five Japanese (or more correctly, Nippongo) words have been transliterated and translated into English. They are, Seiri (sort), Seiton (straighten), Seiso (shine), Seiketsu (standardize), and Shitsuke (sustain). Implementing 5S in your shop, whether you are a hobbyist or pro, will make your shop time more enjoyable and more productive. You will experience less frustration, you will work more safely, and the chances are pretty good that the work you turn out will be of higher quality. You will also gain space, as organization is a key ingredient of any 5S program. A 5S program does not require you to strip your shop to the walls and start over. It works with your existing layout, and instead concentrates on cleaning up and organizing. Unused tools, equipment, and supplies are removed. Pertinent tools and supplies are organized into logical "work groups" or "kits" and are labeled or even color-coded to provide an easy visual reference. Methods are implemented to standardize certain tasks and the process itself, and then systems are put in place to maintain the new order and achieve repeatable results. The first step in the process, Seiri, has been Americanized as "sort" and is a pretty accurate translation of this critical component. In addition to being woodworkers, we are all, to some degree, tool collectors. The Sort phase of 5S'ing your shop is to critically examine your collection of tools and remove those that are not used. The advantages are multifold. Since upgrading to a fine quality jack plane, the old bargain plane that I bought years ago at a home center has been nothing more than a non-powered dust collector. The few dollars it sold for on eBay went into my "stash" for future tool purchases and the newly acquired shelf space went to a tool used much more frequently, but that had formerly been stored inside a cabinet. This experience was an epiphany of sorts. Instead of groping inside a cabinet for a tool I use often, it is now right on the shelf where I do most of my work. A tool I never used is no longer cluttering my workspace, and I freed up a couple of dollars in the process. Seiri – I could learn to love the language! 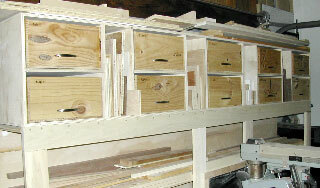 Take a few moments in your shop and think through the "sort," or Seiri, phase of 5S. Are there tools you never use? 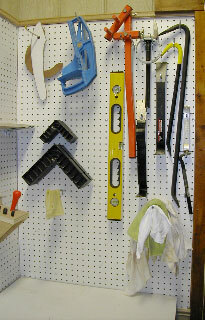 Or are there tools you use so infrequently that perhaps storing them somewhere besides in your shop would make sense? That collection of nuts, bolts, and assorted hardware you are hoarding has needed sorting and organizing for years. Do you really need that one hinge without its matching half? Do you really need that coffee can of bent nails (admit it, I know you have one)? Chances are, there are three, five, or ten common fasteners you use 95% of the time, and everything else is just eating up space and gathering dust. At the current cost of scrap metal, 20 or 30 pounds of unused hardware will not make you rich, but it will pay for the gas to get it to the recycling center and the space you gain will make you more efficient. For me, the sort phase is a continual process. I force myself to seriously ask the question, "Will I ever use this 5/8" X 3/4" X 4" piece of cherry, or would I be better off using it as kindling in the fireplace? 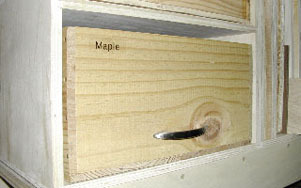 I now keep a box close to the door, and small cut-offs go directly into this "tinder box" instead of my scrap bin. Space gained, clutter eliminated, efficiency improved! 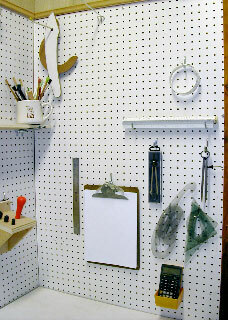 Before 5S Pegboard above my drawing, drafting, plotting, scheming table – what are those wrecking bars doing in a furnituremaking shop? After 5S Wrecking bars gone, drawing tools close at hand, and room to spare! Total time to 5S this part of my shop? About 20 minutes. Seiton, straighten, or "set in order" is the next step in 5S'ing your workshop. Ben Franklin said "A place for everything and everything in its place," but for his adage to hold true, he must have exercised Seiri first. Until you sort and dispose of unused tools and materials, your "place for everything" will consume your shop and there will be no room to have "everything in its place." After you have gotten rid of everything you do not use, it is then much easier to "set in order" what is left. If you do layout work at your workbench, all your layout tools should be close at hand. Clamps close to your assembly table, drill bits by the drill press, and push blocks by the table saw make sense, but few are diligent about purposefully rearranging things to achieve these logical goals. In the middle of a glue-up that I had rehearsed and tested, I discovered I needed a couple more clamps. The trip to the other side of my small shop did not take a lot of time, but it was frustrating and added to the stress of an already complicated glue-up. A little rearranging solved the problem forever. Straightening, or "setting in order" should include labeling. Yes, I know, you are the only person in your shop and you remember where everything is – sure! And I remember what double mocha latte half-caf nutmeg-sprinkled thing Donald ordered at the coffee shop! Ask yourself honestly, "How much time have I wasted in the last year looking for something?" A Brother P-Touch labeling machine is one of the best "shop" investments I have ever made. With clear, white, or yellow label tape in a variety of sizes, you can make labels for everything, and months or years from now, those labels will be as clear and legible as they were the day you made them. There is certainly no need to label everything, but "hidden" storage, like cabinets, drawers, bins, and boxes should always have labels. You may also want to label certain tools that (only) fit certain machines. For example, I would not think of labeling every Allen wrench, but the Allen wrench that is needed to adjust my router table fence is labeled, and it is stored in the same drawer with my router collet wrenches. This is the essence of "setting in order." Label items that are used often and that might be easily confused with other similar items, then put these items in proximity to where they are most used. 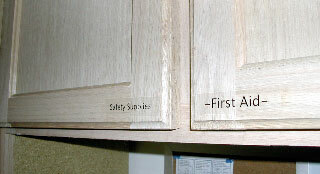 Cabinet doors should be labeled with their contents. The Seiton, or straighten phase of making your shop more efficient, comfortable, and productive need not be done all at once. Like all of 5S, think of Seiton as ongoing, continual improvement. If you notice that you are consistently using a certain chisel when fitting mortises and tenons, keep that chisel stored close at hand. In some circumstances, I have even bought a duplicate tool, simply because I was constantly using that tool at two different places in my shop, and it was never in the place where I was working. The few extra dollars for a duplicate tool has saved me time, time and again. Resisting the temptation to mount my editorial soapbox, I will concede to one indulgence, and write that Seiso, the "shine" portion of the 5S philosophy, is my favorite. After sorting through tools and materials, disposing of what is not needed, and then straightening and organizing what is left, a good thorough cleaning, and daily diligent upkeep, will make your shop safer, more pleasant, and more efficient. A while back, in another publication, I read a reader-submitted tip for installing a rare earth magnet in a dustpan to catch errant hardware, and in another publication saw a similar suggestion for using a magnet to separate hardware from the airflow of a dust collector. I laughed at the inglorious tip, wondering how hardware got on the floor in the first place, and why the woodworker would not simply pause and pick up the screw or nail when it fell. I then realized, like in so many shops and shop pictures that I see, the writer's shop was probably covered in dust, shavings, and other detritus, making it impossible to find a dropped nail. In some shop pictures I have seen, you couldn't find a dropped router! I do not own the best dust collection system (saving my scrap metal money for a new one!) but I suspect that even with the best, some stray chips will still get away. Like gassing up our vehicles, no matter how much we shake the hose, tap the nozzle, and keep our fingers crossed, some gas always drips out onto our newly washed and waxed paint. 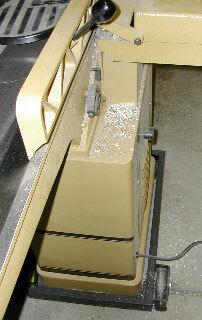 My jointer "spits" some shavings out the side, and there is always a little pile underneath the machine when I move it. The planer has very efficient chip/dust collection, but chips still escape the whirlwind and settle on the floor. The same is true for every other power tool, and the pile of shavings at my feet after a good workout hand planing a tabletop is impressive. You may think me a bit too "Felix Unger-ish," but a couple of minutes vacuuming every hour or so makes the work environment more enjoyable, and infinitely more safe. matter how good the dust collector. your projects will be better! Seiketsu, the fourth step, is to "standardize" the first three components of 5S. A better word might be to "inculcate," which is to instill an attitude or habit through instruction and repetition. After your initial "sorting" of items in your shop, and then "setting in order" what is left, you may find yourself briefly disoriented at times, as in "Now where did I put that half inch mortise chisel?" Don't worry. Herein lies the true beauty of the 5S system. If, in the Seiton, or straighten phase, you put that chisel in the right place, you will quickly adapt to its new location and that location will become second nature. You will find yourself reaching for and grabbing the chisel without consciously looking. You will enjoy concentrating more on your work and less on "where is that tool?" And, if you did not put it in the right place, you will also quickly discover the inconvenience, and you will move it until it is in the right place – until it just feels "right." As you can no doubt see, 5S is an ongoing process. It can easily become a workshop "way of life." Once you realize how much more fun your shop time can be, once you recognize that you are spending more time building and less time looking for tools, jigs, parts, and materials, and once you come to realize the safety and efficiency benefits of sorting, straightening, and cleaning, you will be hooked. The beauty is, you will probably be subconsciously hooked. Sorting will become second nature. Orderliness will become rote. Cleanliness will be a passion (or at least a habit). And when all of this occurs as a part of your regular routine, you will have standardized the process (Seiketsu) and in so doing, will have also achieved the fifth "S," Shitsuke, or "sustain." Implementing 5S principles in your woodworking shop will heighten your enjoyment, extend your creative time, maximize your space, and enhance your safety. Give it a try!